In early December 2017, reports from Saudi Arabia and Egypt claimed that the United States had offered the Palestinians Abu Dis as their capital in the “deal of the century,” rather than Jerusalem.1 The reports were denied. Mahmoud Abbas’ “insult” can be understood, even if one does not agree with his standpoint. For him, Abu Dis, which was transferred to Palestinian civil control as Area B within the framework of the Oslo Accords, belongs to the distant past. Since Mahmoud Abbas (as Arafat’s deputy) and Yossi Beilin (a minister in the government of Yitzhak Rabin) drafted the “Beilin-Mahmoud Abbas Agreement” of 1995, a lot of water has gone under the bridge in the negotiations between Israel and the Palestinians over the Jerusalem issue. At the time, the Jerusalem suburb, Abu Dis, took center stage, as it was represented as an alternative capital of sorts for the Palestinians (instead of Jerusalem). However, two Israeli prime ministers, Ehud Barak and Ehud Olmert, have since placed on the negotiating table far-reaching proposals for the division of Jerusalem itself: Barak vis-a-vis Arafat, in Camp David 2000, and Olmert vis-a-vis Mahmoud Abbas in 2008. Mahmoud Abbas today refuses to accept or even talk about a lesser proposal than what was offered to him then. In fact, he refuses to recognize the different political reality in Israel, represented since 2009 by the elected Prime Minister Benjamin Netanyahu. Is Mahmoud Abbas’s position on Abu Dis the end of the story? In the near future – it seems so. For the longer term – perhaps after a change of leadership in the PA – and if Abu Dis is presented as a solution within the framework of an interim arrangement and not as part of a permanent settlement, things may change. The history of the village of Abu Dis, only a fraction of which was annexed to Israel as part of Greater Jerusalem in June 1967, shows that in the past, both Palestinians and Israelis accepted that Abu Dis could play a key role in resolving the conflict between the two sides. Abu Dis is located precisely on the route of the corridor – according to the historical Beilin-Mahmoud Abbas Agreement and other plans – which was designed to connect the Jericho-to-Jerusalem area with the Temple Mount as a sovereign Palestinian corridor, a kind of “safe passageway” across Jerusalem. The village, adjacent to the outskirts of the Ras al-Amud neighborhood, has become over the years the nexus between the southern and northern parts of the West Bank and has been identified in practice as the eastern gate of Jerusalem, from which the Jordan Valley can also be accessed. The Beilin-Mahmoud Abbas Agreement2 was an unofficial document on the final status parameters drafted by the representatives of Yossi Beilin and Mahmoud Abbas: Yair Hirschfeld and Ron Pundak from the Israeli side and Hussein al-Agha and Ahmad Khalidi from the Palestinian side. On the issue of Jerusalem, the joint document proposed to “expand the present municipal boundaries of Jerusalem” and to “maintain one Municipality for the ‘City of Jerusalem’ in the form of a Joint Higher Municipal Council” to be run by a Jewish majority. Under it, two “sub-municipalities – an Israeli sub-municipality, elected by the inhabitants of the Israeli boroughs, and a Palestinian sub-municipality, elected by the inhabitants of the Palestinian boroughs” – were proposed. The Jewish sub-municipality that would be responsible for all neighborhoods in the western and eastern parts of the city and the Arab sub-municipality would provide identical services to the Arab residents in the new and expanded part of Jerusalem. A few days after these understandings were reached, Yitzhak Rabin was assassinated, and the whole process was interrupted. Shimon Peres, who replaced Rabin as prime minister, rejected these understandings, as did Benjamin Netanyahu and Ehud Barak. 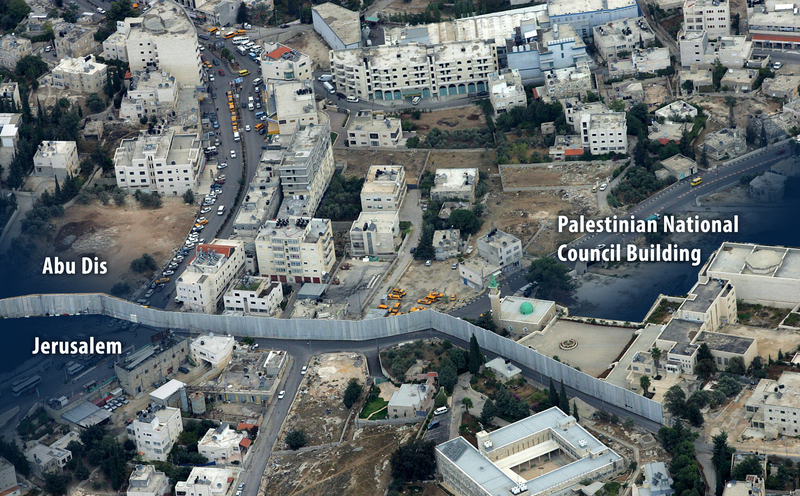 Despite this, Abu Dis developed in the late 1990s as a Palestinian governmental center. Dozens of PA offices were established there, including the Palestinian Local Government Office, the headquarters of the Palestinian security services, and the office of the Palestinian Governor of the Jerusalem District, Jamil Othman Nasser. Above all, rising five floors high, was the Palestinian parliament building. Two million dollars were invested in its construction. In the parliament plenum, 162 seats were already installed and another 123 seats prepared for guests. On the upper floor, two spacious chambers were prepared for the chairman of the PA and for the parliament speaker. A small part of the Abu Dis building actually fell in within the jurisdiction of the Jerusalem Municipality, but the latter received political instruction to refrain from taking action against this deviation. In practice, the Israel Police and the IDF waived any significant presence they could have shown in the Israeli part of Abu Dis – 10 percent of the village area – which was included within the boundaries of the Jerusalem Municipality, while on the other hand, the Palestinian security presence of the PA was well felt. On May 14, 2000, the Israeli government headed by Ehud Barak decided to hand over to the Palestinians as “an advance” Abu Dis and two other Palestinian villages in the Jerusalem area (outside the city’s jurisdiction) with Area B status. The decision was approved by the government and the Knesset though opposed by the Shas party, and was intended to give the Palestinians in these areas, including Abu Dis, security control, not only civilian control, and in effect to turn Abu Dis into an area under full Palestinian control, defined as Area A. The following day, with the outbreak of riots in the territories over the Nakba, Barak withdrew his decision, which has not been implemented to this day. Three years later, when the separation fence erected excluded Abu Dis as part of the Jerusalem envelope, the reality changed. Abu Dis was effectively separated from Jerusalem, and its residents, who viewed Abu Dis and the east Jerusalem neighborhoods bordering it (within the jurisdiction of the city) – as a single urban fabric, now had to cope with a different, often burdensome reality: entering the city via checkpoints and walls. The route of the separation fence that was drawn up in those years by Israel accidentally “erased” small areas within the jurisdiction of Jerusalem. Israel rectified these errors by swapping same-size areas with the PA. At the same time, by request of the Franciscan Church, the Notre Dame Hospital remained on the Israeli side of the fence. In the early 2000s, the Jerusalem District Planning and Building Committee approved Plan No. 7659 for the construction of a small neighborhood in Kedmat Zion, with 220 housing units on Jewish-owned land there. The plans were delayed for years by the political echelon and had not yet reached final approval and validity – to this day. In recent years, Abu Dis has become a Hamas-inspired hub of terror. In December 2015, the Shin Bet announced that a large Hamas infrastructure, planning suicide bombings and terrorist attacks in Israel, had been exposed and stopped by the Shin Bet, the IDF, and the Israeli Police. The aborted activities took place in the Abu Dis area, around Judea and Samaria, and in the vicinity of Jerusalem after activists received instructions from the military arm of Hamas in Gaza. Twenty-five activists were arrested, mostly students from the University of Abu Dis, whose interrogation revealed that at the head stood Ahmed Gamal Musa Azzam, 24, a resident of Qalqilya on the West Bank, who was recruited by Hamas operatives from the Gaza Strip to prepare an infrastructure to carry out terror attacks. Over the years, the security wall itself had become a focus of disturbances. Molotov cocktails and booby-trapped explosive devices are often thrown at IDF soldiers in the area, and in June 2017, improvised explosive devices were discovered in a lab in Abu Dis. In the last few years, weapons-producing machines and lathes were also discovered, producing mostly Carlo guns, which have been used by terrorists in many shooting incidents in Judea and Samaria and east Jerusalem.